Purpose: To design a family of office accessory products. Description: The point of view for this project was to design for collaborative office environments -- spaces in which multiple people are working together creatively. These products are physically appealing as well as functionally intuitive. 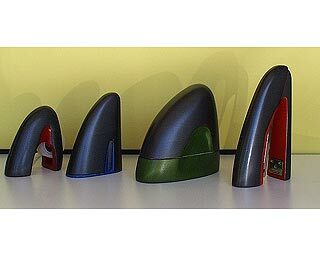 A fin-like form was chosen for its energetic character and implied motion while the elliptical cross section shape minimizes the footprint of the objects and its visual weight. The family is unified in form, and differentiated in weight, proportion and color. Each product is designed to be held, and grip details accent this intended use. The clock uses a traditional hour and minute hand super imposed on a digital LCD screen. This gives the clock added functionality such as a timer for brainstorms, etc. This information would then be displayed on the LCD while always keeping the time on the analog hands.